Far more robust than just a username and password, two-step verification employs a second layer of security, performed immediately after the first check and usually asking something unique to an individual, before allowing access to an online facility. Google Authenticator is one of several apps and password managers which use 2FA (two-factor authentication) to verify user identities and thus act as an effective security gateway. So if you’re serious about data security, 2FA is one of the first business security tips you should consider. Devising an effective policy is straightforward enough, but no policy can be effective unless it is also strictly policed and globally observed within your organisation. Any password used should be sufficiently strong – which means designing a system which forces users to incorporate elements (such as numbers and/or random characters) that will add a layer of complexity. Password access should be demanded at all levels and across all devices and platforms. And most importantly, all passwords must be changed at 30 or 60-day intervals. Your business data is vulnerable whilst it is stored or transmitted, and data encryption (scrambling data to make it unreadable without a private key) is the primary means of preventing unauthorised access to your data content. A comprehensive system must be deployed to ensure sthe tandard protection of email communication also extends to cover mobiles, desktops, data drives and company servers. A modern, reliable method of data encryption which functions automatically will provide seamless protection against the risk of data loss. This is probably the cheapest of all business security tips, but it’s also one which is absolutely crucial to any credible data security initiative. Hardware and software manufacturers operate a policy of continuous improvement which, as well as introducing refinements which improve the performance of their products, also involves releasing regular security patches. This action addresses known vulnerabilities and initiatives designed to protect against the very latest emerging security threats. Even if updating is sometimes a challenging task, it is the IT industry’s default method of combatting threats to cyber security, and should never be ignored. Information and data records held in paper form are often harder to secure and monitor. So, as well as saving physical space, storing and retrieving your data in a digital format often makes it faster and simpler to track changes, store and update records, and share information in the normal course of company working. However, unlike other business security tips, it must be acknowledged that some business sectors may have customer interface operations which will still require the use of paper formats. 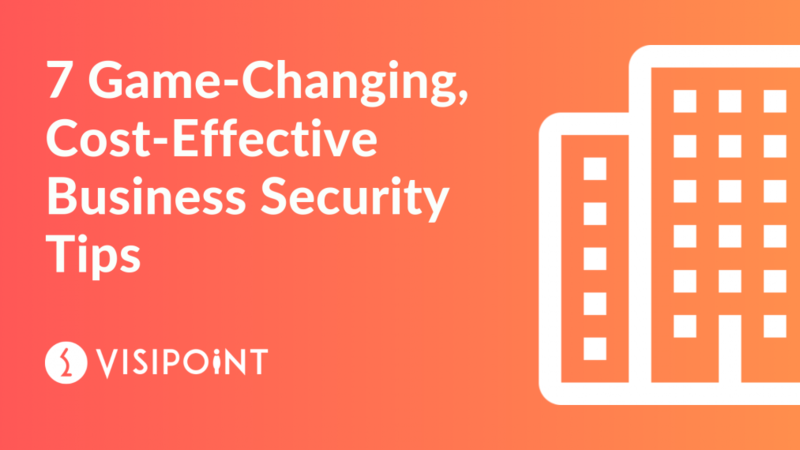 One of the core data-security recommendations, using an off-site backup solution to safeguard information essential to your business is surely just common sense. Though data loss can occur through criminal activity, it can also be the result of accidents, hardware malfunctions, software glitches and more. In such circumstances, the only truly secure option is to keep regularly updated backups of your data in an entirely separate physical location. If a data disaster should strike, this action will most certainly limit its impact on your business. Looking at business security tips for personnel of all kinds, a well-designed visitor management system can help to control and monitor access to your business facilities. Not only does this option offer extra security, in reducing your reliance on salaried staff it also represents a longer-term cost saving. Furthermore, a flexible system controlling access to certain business facilities can also perform useful personnel tracking and data gathering functions too. Therefore, a visitor management system offers a far more comprehensive set of data-security benefits than a traditional paper visitor book. If you’re thinking about improving on your existing building security strategy with a sign-in solution, speak to the VisiPoint team on +44 (0)191 341 0016 about the best visitor management solution for you.